Great presentation. Ace code, music and gfx. This is looks great, but i'm pretty sure its completely cheated and not quite what Blueberry meant. If you only look through the centre, its got all the layers it claims. 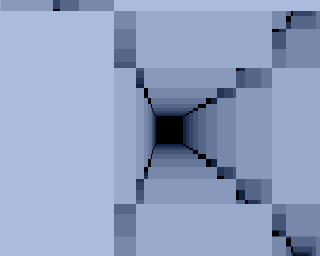 However, if you look at some of the gaps to the side of the centre "tunnel", you can clearly see that the square gaps are in places all black, when the depth/layers of the effect should be reproduced throughout to minimise seeing black. I could be wrong of course, but i'm guessing that outside of the centre, not all the faraway layers are being plotted, using the centre to obscure it. Great stuff... thanks to Premium and Dascon for getting stuff for Axis. Cool stuff - always great to see OXYRON back in action! This matches the TEK one and beats the Tulou one! But as a demo watching it hm it's a bit boring to watch and slow movement. That's a lot of layers! friendly thumb for my music and gfx friends, but also a motivational thumb for axis! looking forward to more amiga releases from you!! Nice stuff! Gotta love the work of the three old dudes. Me likes! However, why not more palettes? Nice presentation and great music..
page created in 0.016613 seconds with 15 queries.